Can you imagine clapping two coconut shells together and hearing the sound of an AT-AT stomping against the ground? Well, that has absolutely nothing to do with the Ministry of Silly Walks. Well, not absolutely nothing. They both feature in Monty Python things. Which makes one wonder what it would be like if Monty Python did a movie in space. No doubt it would rival Space Balls in its hilarity. 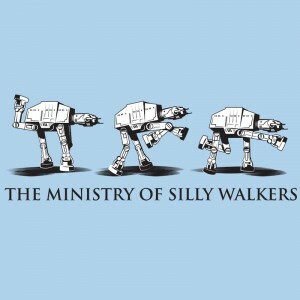 I’m gonna be honest here, I don’t really have a whole lot to say about this shirt except that I think it’s hilarious and imagining AT-ATs doing silly walks is going to be my night-time fall-asleep activity from now on. Wrap this cloth around your torso to make your nerd friends laugh.